"Soap characters with unhealthy lifestyles should be shown reaping the consequences, say doctors. Private healthcare firm Bupa has released its "top ten" unhealthiest characters, arguing they could be used to hammer home health messages. 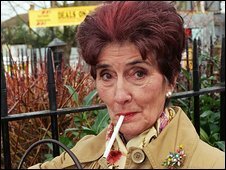 It said heavy smoker Dot Cotton, from Eastenders, should appear breathless, with heavy drinkers in soaps having broken veins. A BBC spokesman said it always tried to depict illnesses accurately" - BBC.